The 8E Railway Association was formed in July 1981 by a group of local railway enthusiasts who had become involved in servicing the steam locomotives that we’re stabled at the former Northwich steam shed in the weeks prior to the 1980 ‘Rocket 150’ celebrations being held at Rainhill on Merseyside. Following on from the celebrations at Rainhill, steam locomotives continued to visit Northwich and were serviced by the same group of enthusiasts. At the suggestion of the then Area Manager, David McIntosh, the group was formerly constituted in July 1981 as the 8E Association, taking its name from the former British Railways steam shed code for Northwich (8E). Over the years many locos were ‘8E serviced’ including Lord Nelson, Duchess of Hamilton, Leander, Evening Star, Clan Line, Princess Elizabeth, King George V and Flying Scotsman, the group earned itself an excellent reputation for the quality of the work it undertook in cleaning, preparing and servicing main line registered steam locomotives. Following the closure of Northwich MPD in November 1984, the last locomotive to be serviced at Northwich was number 6201 ‘Princess Elizabeth’ in 1986, albeit not on the shed but in the Northwich Freight Yard, thereafter our servicing activities were transferred to Chester. In 1987 we were asked by the National Railway Museum to clean and prepare the LNWR locomotive ‘Cornwall’ at Crewe Works in readiness for its appearance at the Works Open Day, where we were to act as stewards for the locomotive on behalf of the NRM. As a result of our involvement at Crewe Works we were approached by the then manager of the newly constructed Crewe Heritage Centre to assist with cleaning, servicing and stewarding the various locomotives that were to be displayed at the Heritage Centre following its opening in June 1987. After a very successful season, the Association maintained its involvement at the Heritage Centre and now some 30 years later we still have members actively involved with the Centre’s operation. 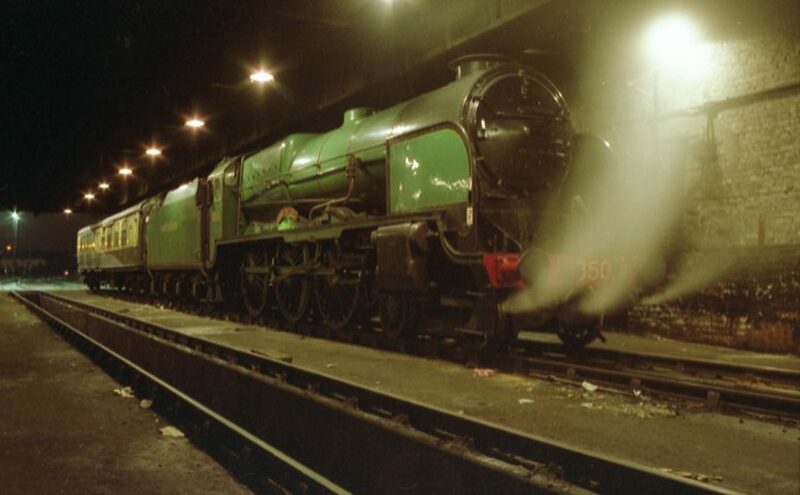 In the new millennium the Association changed its name to the 8E Railway Association to more clearly indicate the nature of our interests as it was felt that the number of people who would recognise the significance of 8E as a steam shed code were becoming less in number. Although we no longer service main line steam locos as a group, the 8E Railway Association continues with its aims now more aligned to promoting railways and railway preservation generally, and to this end we are now more of a social organisation. A varied programme of talks, and slide/film shows of both historical and modern railways, and other events are held monthly throughout the year from September through to May with usually a couple of summer trips that are railway related during the June to August period. A number of our members are also involved with other preserved railways, either as working volunteers or supporters. Photo above: SR 4-6-0 locomotive 850 ‘Lord Nelson’ and support coach on shed at Northwich in the early 1980s.